How Pictures Came from Jupiter. As MENTIONED EARLIER, Pioneer 10 and 11 each carried a small but intriguing instrument called the Imaging Photopolarimeter (IPP). This instrument measured the strength of sunlight scattered from the clouds of Jupiter, and converted the information into digital representations of different shades of red and blue that made up each image of Jupiter. This digital information was then transmitted to the Earth as part of the spacecraft telemetry. 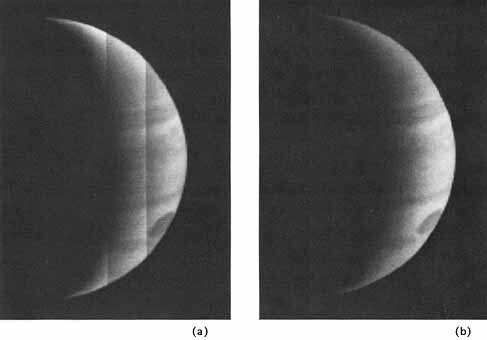 With the aid of computers, scientists converted these signals into patterns of light and dark on a photographic film; they made unique pictures of Jupiter. This chapter describes the complexities of the process and shows how scientists overcame many of the problems of producing images of the giant planet. Photographs in newspapers and magazines are reproduced by a half-tone process. If these pictures are enlarged many times, they are seen to be made up of thousands of regularly spaced, little black dots of varying sizes. Dark areas have large dots and light areas have smaller dots. These dots are too small for the unaided eye to separate them. and the viewer sees what appears to be a continuous distribution of changing gray levels that make the picture. The shade of gray is controlled by varying the dot size; small dots give the impression of light gray and large dots form the dark gray areas. Instead of being made up of dots a picture can consist of small contiguous areas called picture elements, or pixels, each with its own shade of gray. Pixels are usually square or rectangular, and if there are enough shades of gray and if the pixels are small enough, the eye fuses the array of little squares or rectangles into a continuous, smoothlooking picture. The shades of gray? or gray levels as they are usually called, can also be subdivided into a limited number of different values A number, say 64, evenly spaced shades of gray are chosen. Black is thus represented by 0, white by 63, and the intermediate shades by numbers I through 62. Figure 7-1(a) shows a photograph originally consisting of pixels and gray levels instead of the conventional dots, although reproduced in this book by a dot process. A small portion of the picture shown magnified in Figure 7-1(b) reveals the pixels and the gray levels. 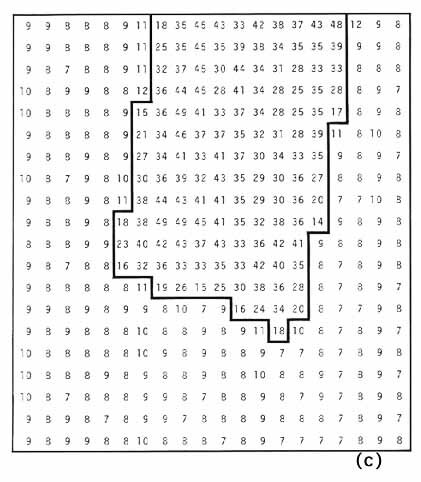 The list of numbers, shown on the right (Figure 7-1(c)), corresponds to the gray levels seen in the enlarged part of the picture. Figure 7-1. 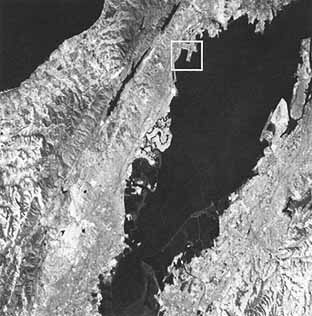 This scan photograph from an ERTS satellite shows the San Francisco Bay Area where Pioneer Mission Control Center is located at Ames Research Center, Moffett Field. (a) Shows the gross view of the whole area. (b) An enlarged view of part of the area to show the runway at San Francisco International Airport. The area covered is designated by the white square on picture (a). The enlargement here shows how the picture consists of discrete squares having different tones of gray. (c) At the right is a computer listing of numbers to identify the value of the gray level of each square. ...that is gathered from each of many small areas in the scene. The brightness reading is converted, or coded, into a binary number (a string of zeros and ones, somewhat like the dot-dash nature of the Morse code) and sent by radio or over wires to a distant receiver. There the stream of impulses is converted back to appropriately positioned small gray areas on a film, thus creating a facsimile of the original scene. Processes similar to this have been, in use for many decades for wire transmission of newspaper photographs and are known as facsimile systems. However, prior to this mission to Jupiter, such a system had not been used to obtain images of distant planets even though it had been proposed for this purpose as long ago as 1953 for a Mars orbiter. instead all imaging of planets from spacecraft-except the Earth from Earth satellites used television or conventional cameras. For many reasons, such as weight and power requirements, it was decided not to use a TV system for Pioneer Jupiter, but rather to apply a well-established alternative method using a spin-scan telescope, a method already used by NOAA satellites to produce weather maps of the Earth. A more detailed technical description of the imaging photopolarimeter (lPP) used in Pioneer is given in Appendix 1, but basically this is how the instrument operates. A small telescope collects light from a 0.028 degree square (i.e. the equivalent of a one-centimeter square seen at a distance of 20 meters or a one-inch square at 55 yards) located along the direction the telescope is pointing. This direction is called the line of sight. Color filters separate red and blue components of the light, and the strength of these components is then measured electronically. Figure 7-2. Diagram of the imaging photopolarimeter system. As the spacecraft spins, the line of sight of the telescope sweeps out a large cone in space. This cone intersects Jupiter, and the instrument records the brightness of the reflected light from small contiguous areas of the planet along a swath, as shown in Figure 7-2. The intensity of the red and blue light reflected from each of the scene's elements is translated into a number from 0 to 63, which is telemetered back to Earth. The sequential string of numbers provides information on the different strengths of the red and blue components of each pixel along the swath. On successive rolls of the spacecraft, the swath is displaced sideways step by step, so that, over a period of time, the whole planet is scanned and an image can be built up. The basic way of displacing the swath is to change the look angle, which is the angle between the telescope's axis and the spin axis of the spacecraft. An automatic feature of the instrument provides for the telescope's look angle to be stepped larger or smaller by a small amount between each roll of the spacecraft, thus giving the required coverage of the whole disc of the planet. In the example shown in Figure 7-1, the pixel scans are straight, evenly spaced lines, but for the Pioneer pictures the situation is quite different. Basically, the Pioneer scan lines are curved because of the way in which the cone intersects the ellipsoidally shaped planet. Additional distortions  occur because the spacecraft moves an appreciable distance along its curved path around the planet during the time it takes to gather all the many swaths of data needed for a complete picture. Also, the planet is spinning about its own axis sufficiently fast to affect the shape of the scan lines. To reconstruct an image, project scientists need to know precisely where each piece of data came from. For this purpose scan maps are constructed (Figure 7-3). The intersections on the distorted grids shown on these maps are the points that define the small areas from which the light intensities are measured. Only every 25th roll and every 25th sector (group of pixels) are shown on the figure. There would be 625 times as many lines and intersections if all rolls and sectors were shown on the figure. The imaging photopolarimeter gathers data for only a small part of the complete 360 degree roll; either for 14 or 28 degrees as commanded. The rest of the roll is used to transmit data back to Earth. To tell the instrument at which part of the roll data must be taken, controllers send the spacecraft "spoke" commands. These commands define the part of a roll of the spacecraft in the same way that numbered spokes might define part of the circumference of a wheel. Figure 7-3. 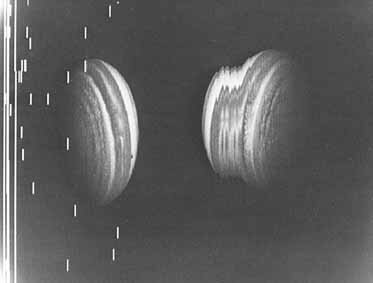 Two typical scan maps of Jupiter showing how the line of sight of the scan telescope sweeps across Jupiter and builds a picture consisting of discrete areas of different shades of gray. (a) A distant picture produces a relatively undistorted grid. (b) As the spacecraft approaches closer to Jupiter, the trajectory curves more, the spacecraft accelerates, and the imaging photopolarimeter takes longer to scan completely the larger disc of the planet so that more rotation of Jupiter takes place during the scanning process. The result is that the grid is considerably distorted. Many other commands are needed in a complex and carefully thought through sequence to obtain spin-scan images of Jupiter and its major satellites. Figure 7-4 is one of many graphic aids used to formulate and assist the command process. The figure shows how the look angle of the instrument should be changed as a function of time to obtain certain images of the planet and its satellites. On the figure the three lines of the shaded band labeled Jupiter represent the center and the outer edges of the planet's disc as viewed from the spacecraft. The curved lines labeled JI, JII, etc., show how the look angles of the Galilean satellites change. The two lines labeled SLA1 are positions to which the instrument can be rapidly sent. These are used for setting the instrument to start a sequence of operations and for recovering from an anomalous situation, such as a spurious command. The numbered, irregular line shows the actual position of the telescope as it gathers data over a twenty-four hour period. The basic command strategy is to take repeated imaging scans of the disc of the planet, interrupted by rapid returns to the starting look angle (SLA) for polarimetry measurements whenever one of Jupiter's Galilean satellites crosses a starting look angle. For example, starting at the left of Figure 7-4(a), the imaging photopolarimeter is at a starting look angle taking polarimetry on Jupiter's satellite Europa, Jll. To get to position 1, 21 commands had been issued, 12 of which were to overcome a problem of unwanted gain changes that had started early in the mission. Between points 1 and 7 in the sequence, 5 additionaI gain control commends are sent at 30-minute intervals. At point 7 in the sequence the imaging photopolarimeter is commanded into its threshold mode (Mode 3), where the instrument moves its telescope in small increments continuously until the edge of Jupiter is automatically detected. This point in the sequence involves 17 contiguous commands. At point 8 in the sequence the instrument is commanded to the imaging mode (Mode 4) and it changes its look angle one step at a time at the imaging rate of 0.5 milliradian per spacecraft revolution. This point in the sequence involves 7 contiguous commands, 4 of which are gain control (sensitivity), and 2 are "spoke" commands. Point 9 in the sequence involves a single command to reverse the stepping direction of the telescope. Point 10 then involves 17 contiguous commands, 16 of which are gain control commands. The sets of commands at points 9 and 10, consisting of I and then 17 commands, are repeated at every similar point in the sequence that follows. Step 14 involves 26 commands, 23 of which are gain control which places the instrument in the polarimetry mode at starting look angle for the crossing of Jupiter's third Galilean satellite Ganymede, JIII. The commanding at point 15 in the sequence is identical to that at point 7, and the commanding at point 16 is identical to that at point 8. At point 19, 3 commands are sent which results in switching back to Mode 3 and stepping beyond SLAT . The commanding at step 20 reverses the direction of turning movement of the telescope to approach SLAT from the correct side in order to stop at a position where the third Galilean satellite is observable. It involved 32 contiguous commands. The rest of the sequence depicted on this chart was constructed by repeating, at the appropriate time, one of the command sequences already described. Similar sequences were executed for 8 hours a day from 30 days before to 30 days after closest approach, and for 24 hours a day from 8 days before to 8 days after closest approach. Figure 7-4. Typical 24-hour observation chart used to command the imaging photopolarimeter and later used to determine how the instrument operated at the time pictures were taken. It provides a visual check on what is happening at the spacecraft as far as the look angle of the instrument is concerned. (a) Is how the chart looks when the spacecraft is distant from Jupiter. (b) Shows the chart about the time of closest approach. The main features of the chart are described in the accompanying text. Figure 7-5. Distortion caused by rotation of the planet during the time taken to build up a spin-scan image. (a) Points A and B at the same longitude are scanned at different times, such that A is in darkness when scanned and B is in daylight, though both should be either in darkness or in daylight. Thus the terminator is distorted. (b) Similar effects occur at the limb and the result is that the outline of the disc becomes distorted. ...properly, from 14 to 20 contiguous, time-critical commands were required at each point where the telescope look angle curve changes abruptly. Gathering data for making one of the larger spinscan images of Jupiter took approximately half an hour. 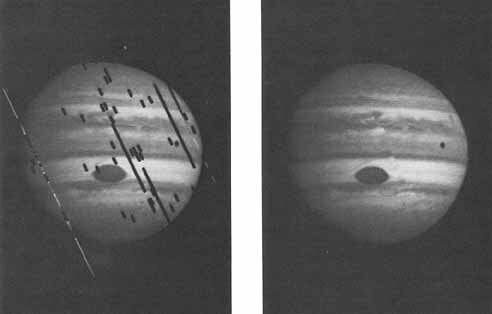 This created a problem since, unlike a normal photograph where all parts of the scene are viewed instantly and from a single point, the Jupiter images were built up from a moving viewpoint of a rotating object. The problem is how to display such an image. One solution is to reposition the data so that it appears as though the picture was taken at a particular instant in time, for example, the time of the mid-point of the data-taking sequence. This repositioning is done by placing each pixel in a place corresponding to where it was at the chosen "snapshot" time, and not at the place where it was on the planet when it was actually imaged. This process, called geometric rectification, creates a picture that is most nearly like one taken with a camera. However, there are artifacts arising from this method of display. They are a direct result of the method of picture taking, i.e., the picture is built up over a period of time during which different parts of the object move by different amounts. For example, in Fig. 7-5a points A and B are points with the same longitude on Jupiter. They rotate through the terminator (the shadow edge between night and day) at exactly the same time. A true snapshot, illustrated on the left would show this. However, it could be that with spin-scan imagery point A was imaged a few minutes before sunrise and point B, being imaged later, will be in sunlight. When points A and B are positioned at their correct places in the reconstruction, i.e., at the same longitude, the terminator appears bent as shown- an unreal situation. A similar problem (Fig. 7-5b) arises at the limb (edge) of the disc. 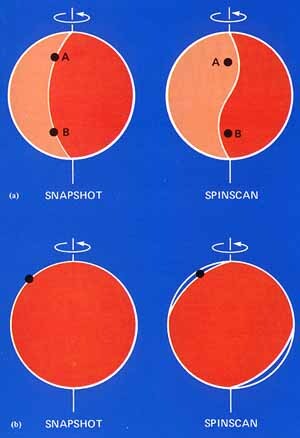 In the spin-scan image, portions of the limb imaged before the equivalent "snapshot" time are displaced in the direction of rotation. There are no data to fill out the correct  profile and the shape of the planet is distorted. These problems are more serious for close-in pictures where it takes longer to scan the disc and where the relative motion effects are more serious. Figure 7-6(a) shows an image that has been geometrically rectified. There are other ways to display the data which are less expensive in computing time. One is simply to disregard entirely the geometrical aspects and to display the data exactly as they arrive from the spacecraft. Naturally this results in gross distortion as can be seen from Figure 7-6(b). Another method is to display the data so as to preserve the correct outline of the planet while accepting some slight distortion of the area within the disc. This effect is appropriately called "rubber sheet" distortion. Small detail in any particular region is accurately portrayed but larger regions may not be spatially related to each other as precisely as in the "snapshot" equivalent picture. Normally the difference between the two results is small. Figure 7-6(c) shows the same data displayed using this technique. For technical reasons it is easier to preserve the fine detail in the pictures using the correct outline technique, and all the pictures reproduced in the next chapter were made in this way. Figure 7-6. Three ways to display a spin-scan image of Jupiter: (a) A fully rectified image is almost equivalent to a snapshot-every small area is repositioned to represent a situation of having been taken at the same time as all other areas and from a fixed point in space. But the picture still contains the types of distortions depicted in Figure 7-5. (b) No geometrical corrections are made. The planet shows gross distortion. (c) The correct shape of the planet is obtained, there is a little distortion of the individual features, but this third display mode requires only a relatively small amount of computer processing compared with the more complicated processing required for display (a). Apart from difficulties in presenting the pictures with the correct geometry, there are other factors that determine the quality of the image. For example, there were occasional data dropouts -loss of data - that resulted in losing parts of pictures. Such losses ranged from a small section of one line of data, caused by a missing telemetry data frame, to the loss of one or more continuous lines. Replacing the missing parts with black fill, or simply skipping over the dropped lines, results in pictures with distracting features which, for scientific and esthetic reasons, it is desirable to reduce or to eliminate. This can be done by interpolating average values for the missing data from surrounding good data. Such "cosmetic" enhancement can be satisfactorily applied only when the fraction of mission data is small. Figure 7-7 shows a severe case before and after treatment with "cosmetic" enhancement. Figure 7-7. Before and after correction of dropped frames of data from a spin-scan image. This cosmetic enhancement is achieved by computer processing to smooth over and insert areas of missing data. During the acquisition of some images the sensitivity of the imaging photopolarimeter would change, sometimes deliberately as a result of a command and sometimes as a result of a malfunction due to radiation. The effect of this is to darken, or lighten, bands within the picture. Compensating for these sensitivity changes is straightforward, and Figure 7-8 shows the before and after Images. There was another minor problem with some of the Pioneer 10 imaging data. The blue picture was everywhere too bright by a fixed amount. This fault was corrected in the data processing. Figure 7-8. Before and after correction of sensitivity (gain) changes. The sensitivity of the imaging photopolarimeter was changed to compensate for changing brightness of the planet as the instrument scanned different areas of the disc. This resulted in the banding on the spin scan image (a). Computer processing corrected the banding to produce the image (b). Two other problems occurred with the imaging data provided by Pioneer 10. Figure 7-9 shows a fine, ripple-like structure of low contrast covering parts of the red image. It represents noise of unknown origin, and, because of its partially random nature, it is difficult to eliminate from the images. This figure shows a particularly noticeable example, although the effect can also be seen in several of the pictures in the next chapter. 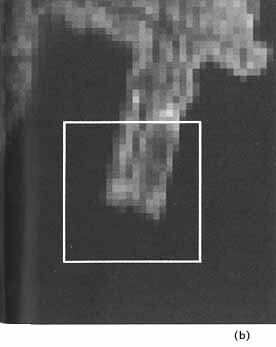 The other defect, which also occurred in some Pioneer 11 images, is illustrated in Fig. 7-10. The apparent flattening of portions of the limb of Jupiter is caused by a characteristic of the mechanism that changes the look angle of the telescope. Figure 7-9. Noise of unknown origin affects the red channel image to produce a ripple-like effect which is difficult to correct because of its semi-random nature. Figure 7-10. A slight flattening of the limb in places is caused by a characteristic of the imaging photopolarimeter instrument's design that results in a slightly non-uniform stepping across the planet. Figure 7-11. A raw data dump (i.e., unprocessed picture) from Pioneer 11. On the right is an image that has been severely distorted by a fault in the telescope drive system. The image on the left suffers from a few dropped frames. The intense radiation problems affected the IPP on Pioneer 11 somewhat differently. After its passage through the most intense part of the radiation belts, the telescope drive mechanism became quite erratic. Instead of stepping uniformly across the planet, it would skip backwards and forwards in a seemingly quite random manner, sometimes not moving at all for several rolls of the spacecraft. The effect of this was to create severely-distorted images. Figure 7-11 shows an example of this problem. Special computer programs will have to be written before these data can be correctly assembled into pictures. The figure shows a raw data dump of blue-channel data for images D17 and D18. image D17 is normal except for a few dropped frames whereas D18, on the right, suffers from this stepping fault. The tick marks around the edge of the picture are used for identifying the roll and sector numbers of the various features in the data. The imaging photopolarimeter gathered data using the red and blue components of the light reflected from Jupiter. To make color pictures it is necessary to have three colored components, such as red, green, and blue. Reconstructing with red and blue only would give rise to a severely purple-tinted image. Scientists were able to make three color composite images by synthesizing a green image. This green image was derived from information contained in the red and blue channels and from knowledge of the color balance and color content of Jupiter images as obtained from groundbased observations. 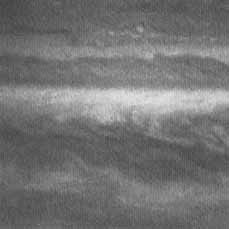 The method works well for Jupiter since the planet has no significant green or purple coloration; a photograph of Jupiter taken through a green filter closely resembles a composite of photographs taken through red and blue filters. Figure 7-12 shows the real red and blue components, the synthetic green, and the color composite formed by the photographic superposition of these three. The effect of not including a synthetic green channel is also shown. This use of color synthesis often assists scientists in their interpretation of clouds and features; however, too much emphasis should not be given to the exact hues and saturations of colors in the Jupiter pictures from Pioneer, because only two of the three components are real. This is even more applicable in the case of the satellites imaged by the Pioneers. Since Earth-based observations have not resolved color features on these satellites, there is no standard for comparison of the colors. Figure 7-12. Constructing a colored picture of Jupiter from the red and blue data channels requires construction of a green image first, to combine with the red and blue. This produces a lifelike image on which the color balance has been adjusted to correspond with the best Earth-based observations of Jupiter. Without the green picture an objectionable purplish Jupiter would result from mixing the blue and red images alone.